Google has announced some fresh new features that are coming to the Android version of Gboard. In the 6.1 update, you’ll get emoji & GIF searches in the suggestion bar as you type, so you can express yourself in new and more fun ways. So when you’re talking with your friend about meeting up for pizza, the pizza emoji will appear in the suggestion bar. The voice typing has gotten a slight makeover, instead of taking up your whole keyboard, it just occupies the space of the suggestion bar, so you can easily go back to the regular keyboard at anytime. Also in the new update, is the ability to use pictures as your keyboard’s backdrop. To do this, all you have to do is go to the Gboard setting and select a theme. Google said that they’ll be adding more themes of a regular basis, so keep checking back for new ones. And finally, the last new feature is the ability to translate instantly with Google Translate in your keyboard. To do this, just press the Google icon on Gboard then the Google Translate Icon and a text bar will show up in your suggestion bar and as you start typing, it will automatically translate in real-time. Google has also added support for right-to-left languages (such as Arabic, Hebrew and Farsi) to Gboard. 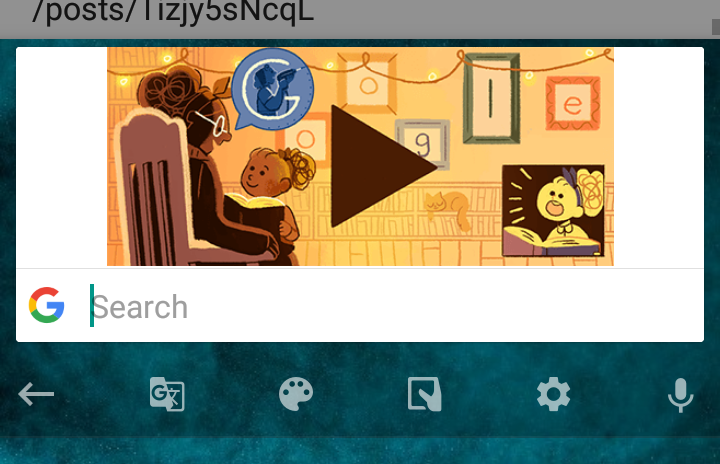 Also, not mentioned in Google’s blog post, is that when you do a Google search using Gboard, it will show you today’s Google Doodle (if there is one). The new 6.1 update for Gboard for Android is rolling out now and you should see the update on the Google Play Store soon. Or if you’re too impatient (like myself), you can download the APK file from APK Mirror.